Across the country, laborers are hard at work lifting 700-pound shelves full of multi-volume encyclopedias, propane grills or garden gnomes and dragging them across vast warehouse floors. Carefully trained not to bump into one another, the squat workers are 320 pounds and a mere 16 inches tall. No, they’re not Christmas elves—they’re some of the most advanced robots that e-commerce giant Amazon now uses to ship its goods. In an exclusive video for TIME, photographer and videographer Stephen Wilkes captured these Amazon robots in action at the company’s Tracy, Calif., warehouse. The robots are made by Kiva Systems, a company Amazon purchased for $775 million in 2012 to better handle the hundreds of worldwide orders Amazon customers make every second. Kiva’s robots bring shelves of goods out of storage and carry them to employees, allowing Amazon to retrieve more items for more customers simultaneously. Amazon began using these robots in July of this year, and there are now more than 15,000 of them in 10 of the company’s warehouses. They whir around like gears on a Swiss watch. "we can ship any product from A to Z with a smile"
Amazon Senior Vice President of Operations Dave Clark says improvements such as the Kiva robots have significantly increased operations efficiency while making employees’ lives easier. Amazon has sometimes been criticized for the conditions in its fulfillment centers, with workers often logging over 10 hours a day and walking up to 15 miles in a shift to pick items off the shelves. Conditions at a Pennsylvania warehouse drew attention to Amazon’s employment practices during the summer of 2011, when temperatures there reportedly reached 110 degrees and employees regularly collapsed with heatstroke. 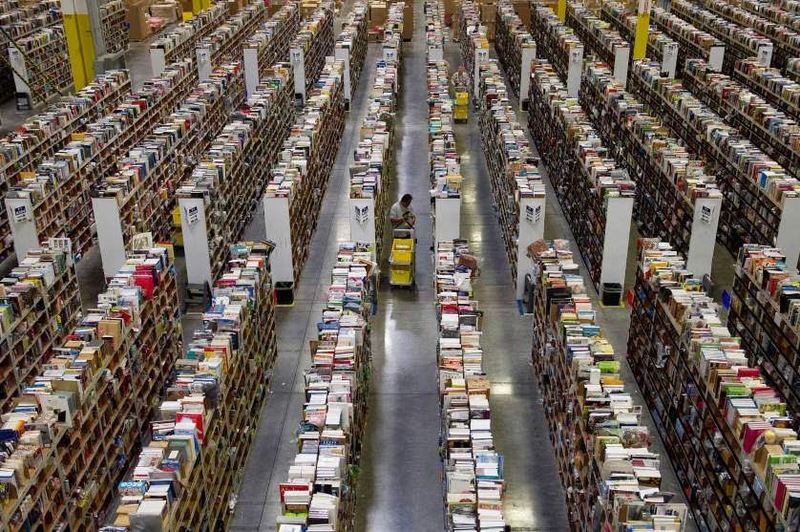 (Amazon has since installed air-conditioners in its warehouses.) The Kiva robots cut out much of the hard “picking” work and bring items directly to workers, who then process the orders. “[Kiva] eliminates the part that was not a fun part about picking,” Clark says. About 80,000 seasonal workers are expected to come on board as temporary help each holidays season. Many of them are tasked with picking items from warehouse shelves — but others ask a robot to do it for them.